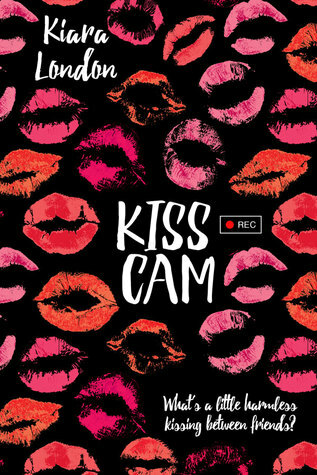 In Kiss Cam, teen author Kiara London asks, what’s a little harmless kissing between friends? Juniper, Jasper, and Lenny have been friends forever and co-own a vlog channel called WereVloggingHere. Their fans are huge “shippers” who believe that Juniper and Jasper are perfect for each other, and, despite warnings from friends and family, a simple Truth-or-Dare inspired kiss soon spirals out of control into a whole new world of making out and surprise kisses. Juniper and Jasper’s relationship begins to shift. But as fan requests for different “Kiss Cam” segments keep pouring in, Juniper puts her worries aside and convinces herself that it doesn’t mean anything. After all, it’s just kissing… right? I first read Kiss Cam as an unedited version on Swoon Reads last year. I loved the book, and I was so glad to hear that it was chosen to be published. It was just so adorable and swoon-worthy and I died a little bit. I found it to be just as cute as I read it a second time. June, Jasper, and Lenny are neighbors, best friends, and famous vloggers. Over the years, the three friends have built up quite the following on their vlog, WereVloggingHere, and with that following has come fans who ship different pairings of the three friends. After a truth-or-dare comment has June and Jasper kissing, a weekly segment is formed which has the two surprising each other with different fan requested Kiss Cams. As the segment becomes more frequent and intense, June is left questioning her and Jasper’s relationship and whether or not they’ve crossed a line in their friendship. Kiss Cam is a best friends’ romance. It’s the basic best friends-to-lovers trope, and I couldn’t help but fall for Jasiper. Like the fans in the book, I love shipping couples together (although, mine tend to be fictional). It was fun seeing what it might be like for the pair being shipped and what kind of pressures that puts on their friendship. I really did love the concept and thought Kiara London pulled it off well. Even though the story was predictable, it was adorable. Sometimes you just need a cute romance as a pick-me-up, and Kiss Cam definitely fits the bill. It kept me engaged and could easily be read in one sitting. I thought the different Kiss Cam segments were fun and creative, but I couldn’t help but wish for more of them. Overall, Kiss Cam is another adorable, swoon-worthy addition to the Swoon Reads line. I definitely recommend it to anyone looking for a fun, fluffy read. Kiara London is the internet savvy, hopelessly romantic alter ego of Bethany Novak-Tveten, who in real life is part of the US Air Force. She started writing on the online writing site Booksie when she was thirteen and then transferred to Wattpad where her debut novel Kiss Cam was originally posted. She spends most of her time scrolling down Tumblr, attempting to read everything she can get her hands on, and drooling over fictional men. I’ve been seeing reviews on Kiss Cam for months!! And I’m really curious about it Great review! Thanks! 🙂 I hope you enjoy it as much as I did if/when you get the chance to read it! This book sounds really good!! Can’t wait to get a chance to read it and hopefully soon! Also, great review!! I always mix up my reads and this book will fit nicely into my evenings after a heavier, emotional book. It’s super cute and fluffy, so it’ll definitely be great after a more heavier read!